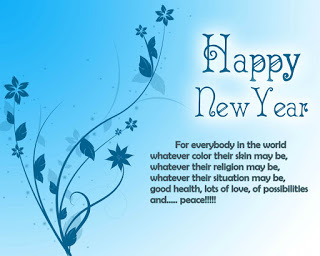 Best Wishes to everyone and may God's Blessings be upon us all during the coming year. It is now almost one year since my wife, Marty, was diagnosed as having Alzheimer's disease. The doctor gave us the news as we sat together. She acted as if she understood. She did not. I have told her that she has Alzheimer's disease and she tells me that she understands. She does not. What she does understand is that something is terribly wrong with her memory. Watching her fight to remember simple everyday things such as whether or not she drinks coffee and she has been drinking it her entire life, is heartbreaking. No one can tell she is ill, except me, of course, and several close friends that know about her condition. When I take her with me to church and to the stores etc. and we see people we know, I always hear how "wonderful" she looks. Yeah, well the Titanic looked all bright and shiny as it headed out into the Atlantic that cold, April day in 1912. When the iceberg did its dirty deed the Titanic was doomed. Nothing could have ever stopped her sinking into the cold Atlantic. A year after diagnosis Marty has become my new seven year-old existing in an older body. She is very insecure and becomes frightened if I am not nearby. She still tries to maintain her independence as a self-sufficient person even though she cannot remember where to put the forks or cups. As her caregiver my life has become disconnected and very unpredictable because of her needing so much while trying to not need anything. Alzheimer’s is never just the patient’s illness. On the contrary, it latches on to the love of those close to its victim using that love in a sordid attempt to destroy their spirit. Most times that results in abject failure because the power of love often proves to be much stronger than the evil disease. Sometimes not. Today, more than 5 million Americans are living with Alzheimer's Disease and about 200,000 of those folks are under the age of 65. 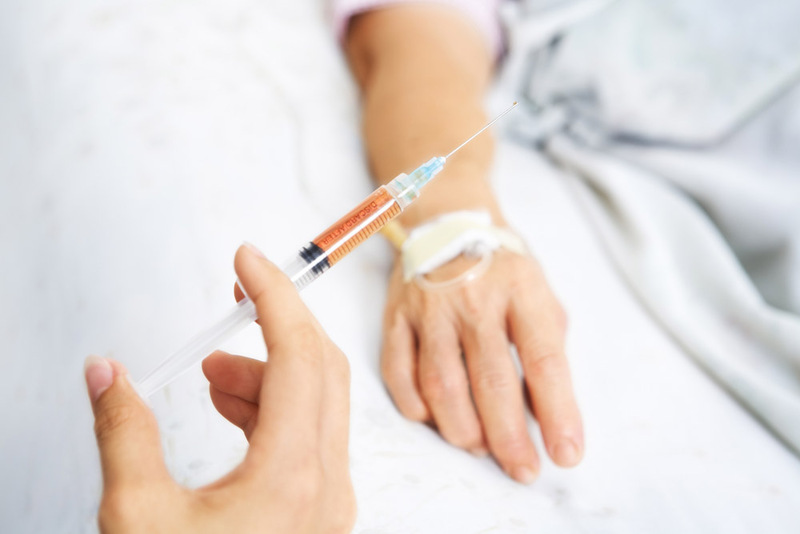 It is the only disease among the top ten that cannot be prevented, slowed or cured. The disease kills more people every year than breast cancer and prostate cancer combined. It is estimated that by the year 2050, 16 million people will have this disease. Someone in the United States develops Alzheimer's every 67 seconds. They have estimated that by 2050 it will be every 33 seconds. This is an epidemic growing before our eyes. It is also becoming a nightmare for more and more moms, dads, sons, daughters, grandchildren, cousins, aunts, uncles, friends and society as a whole. Imagine that all around the country there are people like Marty having their brains slowly erased by an invisible demon inside their heads. Swoosh, swoosh, swoosh; back and forth, back and forth, the tiny eraser keeps moving--back and forth, back and forth. Slowly but methodically the demon goes about its work 24/7. After a while, the person under attack does not even remember how to go to the bathroom. And then, after a time, the eraser stops. It stops when the disease it is part of finally erases the person's life. 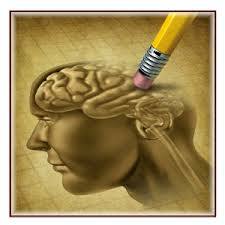 That is the course of the relentless, unstoppable, illness known as Alzheimer's Disease. It is at work at this very moment in different minds all over the world. Somehow, someway we will have to stop it. We will need God's help because this war cannot be won without Him. Since I find myself still filled with the wondrous spirit of the Christmas season I have decided that this will be my final blog post for 2015. I am simply doing everything I can to keep that upbeat feeling a bit longer. I don't care. I like it and I want to feel it and enjoy it a few more days. But right now I am going to smash that spirit with a right uppercut that will stagger it for sure. I am counting on my shaking it off and getting on with the true spirit of the season, feeling the peace and love that exploded all over. Here is how it is (I am just speaking for me). We have the great celebration of the Birth of Christ and the next day we honor the very first martyr, St. Stephen, stoned to death for teaching about Jesus. Two days after that, on December 28th, we honor the Holy Innocents. In case you are unfamiliar with who the Holy Innocents are they are the baby boys massacred by King Herod in his quest to kill the Christ child. Herod, a seedy man insecure in his own pathetic skin, was afraid of toddlers. What a 'man'. Anyway, those remembrances can short-circuit that whole peace and love thing going on. 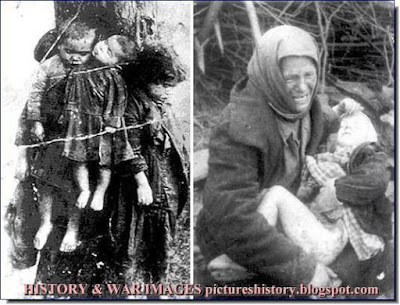 People have been massacring children for thousands of years. Last year I posted this picture of a child I named "Little Christy". It is probably...no, it is, the most heinous, disgusting photo I have ever seen. This Innocent was killed because she was a Christian. Her mom was murdered first and then, satanic fueled terrorists, whose souls have been blackened by an unimaginable demonic presence in each and every one of them, staged this propaganda photo to strike fear into the people in Iraq and Syria and everywhere else they could do so. A picture says a thousand words and this one says it all. King Herod on one end of the spectrum of two thousand years and Little Christy on the other end with ISIS wielding not only knives and swords but also automatic weapons. How "brave" these killers are. The photo below is from the Holocaust in Germany. sometime in 1943. This is a photograph of truth. This is what people do to people. And the most innocent of all, the children, are included. Armenians in Turkey: 1915-1918 - 1,500,000 Deaths. 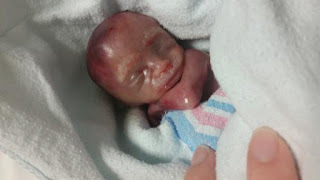 Let us not forget the unborn, those in the womb, those unseen who quietly call out to us all to please help them. Humankind has slaughtered over 50 million of these little people and the numbers are continuing to escalate. So now, as we approach the year 2016, children are being tortured, enslaved, and murdered...all over the world. 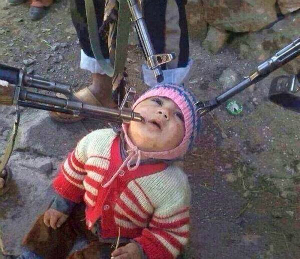 ISIS has beheaded, crucified, drowned and burned countless children because they are considered "infidels". Amazingly, there are some here in the United States, a supposedly highly civilized nation, who believe that Americans who have a different political viewpoint than they do, are more of an enemy to humanity than these monsters we speak of and hear of every day. The bottom line to all of this is; there is a war between Good and Evil. Satan exists and is having his way. He can never win the war but the damage he will have done before he and his followers are vanquished is hard to predict. And the children of today are still being turned into HOLY INNOCENTS more than two millennia later. The Western world must wake up. The secularist worldview is wreaking havoc on society as God is continually taken out of our lives by the self-absorbed "meists" of today. We owe something to mankind and especially to the innocent children who, for the most part, just want to be loved. I'm done. I will now try to recapture a bit of the Christmas spirit that I have temporarily tossed aside. I am sure I will find some left somewhere. There are many millions of us who embrace GOD and LOVE and we can take solace in the fact that GOD is LOVE. I know HE has our backs. Happy New Year to everyone. If it were two thousand years ago and you lived in Nazareth you might notice a young man packing items on a donkey in preparation for a trip. Early the next morning you see this fellow, with his pregnant teenage wife sitting on the back of the burro, heading down the road. They are in compliance with the law of the day. They are embarking on a three or four day journey to Bethlehem, the town of their ancestors' birth, for the census. We know so little about the lives of Joseph and Mary, yet they are THE integral part of the Salvation story. Mary's acceptance of a pregnancy that might have resulted in her being stoned to death as an adulteress was an act of monumental humility. Joseph, a good man and a faithful Jew true to the law, accepted a pregnant woman as his wife, another act of extreme humility. To complete this humble family was none other than God Himself. The Creator of all there is became like one of His creations. He could have come in a majestic way, surrounded by armies and servants and glitter and pomp. He chose to come to us in the womb of his mom, just like all of us. He allowed Himself to be born among the animals in a cave. As He began His earthly life His body was wrapped in cloth and then placed on straw. Why would He do this? He did it to show us Goodness, show us Love and show us how to do it. Finally He did it to save us, save us from ourselves and Satan’s favorite tool, Pride, which had brought down Adam and Eve. The Holy Family was and still is, the complete and perfect embodiment of Humility. It remains so to this very day. Of course, the antidote to Pride is Humility. Isn't God amazing in the way He does things? This is the story of our Salvation and the rebirth of Hope. This Salvation became available to all people for all time and its success was entrusted to a couple of have-not teens whose humility and love of God enabled them to conquer the seemingly impossible. They married against incredible odds and traveled to Bethlehem while Mary was full term. Joseph walked guiding the donkey, protecting his young wife the entire time. Mary gave birth in a cave surrounded by smelly animals and filth and then they managed to escape the soldiers of King Herod who were trying to kill their newborn Son. Lest we forget, they somehow made it to Egypt, about three hundred miles away. We know the rest of the story. We must never forget that within that family it was the husband and father who protected his wife and Son from the evils of the world. The Son humbled Himself and gave his life for us all. And the Mom, our Mom too, the most humble woman ever created, stands ever vigilant ready to crush the head of the evil serpent who might harm any of her children. In so doing she is protecting all of her "children" (which includes you and I) for all eternity. She is our protection against all wickedness. Humility conquers pride. Just look to the Holy Family. If you take a moment to truly ponder all that happened and how it happened and why it happened, it might leave you breathless. And then we remember it was all done for all of us. There was nothing done for themselves, not one thing. We need to get back to "Family" and the Holy Family is the model to build on. 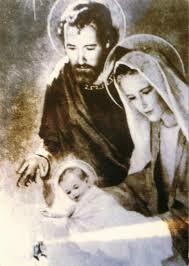 The Catholic Church celebrates the Feast of the Holy Family on the Sunday following Christmas. If you are among the millions of folks who never pay an iota of attention to this family, maybe you should. Why? Because this is the family that "set the bar" for all families. 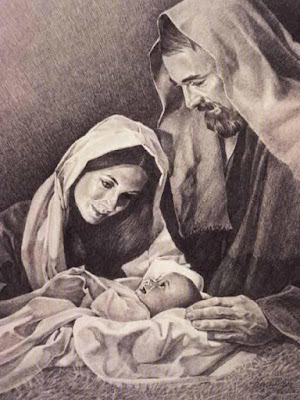 Comprised of two teenagers, Mary and Joseph and their boy, Jesus, their unconditional love for God and each other cannot be surpassed. The Salvation story comprises the greatest acts of combined Love and Humility ever. Yessiree, I always love the Christmas season. It is my favorite time of the year for sure. 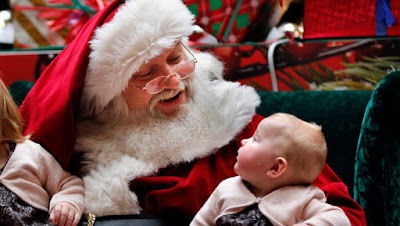 I always, "tongue in cheek", brag that I still believe in Santa. The truth is, down deep inside of me there is a place that only I can go. I call it Stillness. When I travel to Stillness, Santa is always there. So is the most beautiful Christmas tree I have ever seen and a lifesize manger with moving people (guess who). I could go on about my favorite place but I have already revealed too much personal info and, if I am being monitored by the NSA or CIA or Starbucks, I could be profiled. Anyway, I have been momentarily kicked out of Stillness. My reality check started with the Sunday newspaper ads. Trying to acquire some knowledge about today's toy market (in case I need something to discuss with my grandkids at Christmas dinner) I flip open the Sunday flyer from Target. Immediately stunned, I know I must be looking at the ad of the year; it reads... "ready for takeoff" ---"Drones are the season's hottest gift". I can feel the instant pulsing coming from my temples. The advertisement is for the Parrot Airborne Nightime mini-drone that flies in the dark with two headlights and an embedded camera. The price is $129.99. Next to the drone ad is a picture of a Darth Vader talking boom box. This page is for kids. 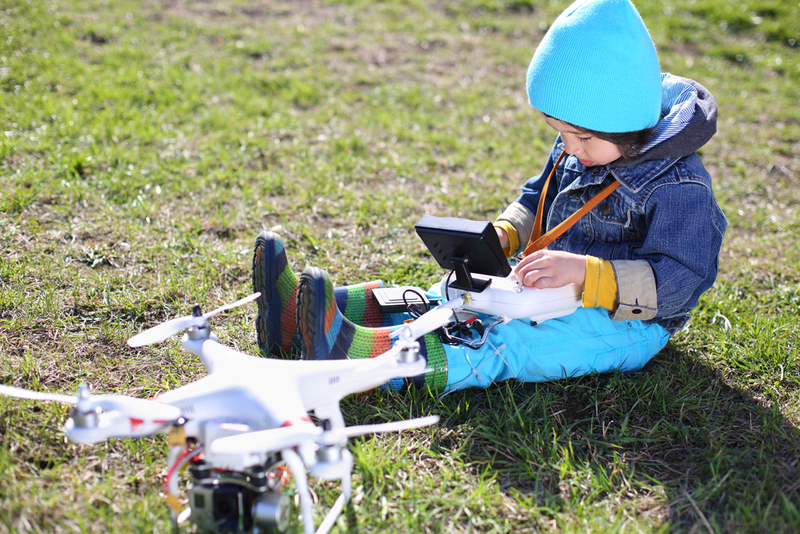 Drones for kids??? What??? Oh, before I forget, all that is required to operate the drone is a smart phone or a tablet. Probably every kid in America over five has one of those. And some of those little tykes are pretty tech-savvy (temple pounding begins amping up). I took a break and tried to get back to Stillness. It took me until Monday afternoon to get back. Tuesday morning, bright and early and calm and tranquil, I scan the front page of the freshly tossed newspaper. On page one is the picture of a drone. A nice story accompanies the picture. "Santa bringing Drones---You have to register it". Yup, it seems that new FAA regulations are in force since Monday because first time flyers must register before flying their drones. You can register online but you have to be 13 or over. That should keep things safe. Headache has begun. They expect that more than 800,000 drones will be sold this Christmas. Drone owners "are aviators (I had this ridiculous notion that you needed a bit of training to be classified as an aviator) and with that title comes a great deal of responsibility." U.S. Transportation Secretary, Anthony Fox, said in a statement. "Ya think, Mr. Secretary?" And the FAA estimates that 1.6 million drones will be sold in 2015, more than half in the fourth quarter (in this case 'fourth quarter' may be a synonym for Christmas time). In less than two weeks we will have almost 2 million "responsible" drone owners of all ages filling the nation's skies with their personal flying machines. Ah, progress. There is a neat little caveat at the end of the advertisement for the Parrot Airborne Nightime mini-drone. It reads, "Prior to piloting your Parrot Drone please make sure you have authorization to pilot in the area you intend to fly. In some areas flying a drone is not permitted ie; such places as military bases, parks, cities and airports. Before starting, check local regulations prior to flying." For more information, visit www.knowbeforeyoufly.org (I did not make this up). With less than two weeks to go before Christmas, Barack Obama and his supporters are talking about gun-control and climate change. Islamic terrorists are killing people all over the world including Americans right here at home and all of that has taken a back seat to politics. But now--we have approval for personal drones that kids will be flying near highways, cities, schools and airports, etc. All they need is a five dollar registration fee. I can leave my house right now and go to Walmart or Target and buy a drone for less than a hundred bucks, register online for five dollars more and I am now an 'aviator' capable of flying my own drone.. Imagine the possibilities. I will have to pray and work very hard if I ever want to get back to Stillness. As long as I don't get hit by a drone coming from the park two blocks away, I know I will make it. I am asking Santa for a football helmet. "No Santa Claus! Nonsense--Thank God he lives! And he Lives Forever." Every year I put this out because it is proof that Santa Claus is real, loves children the world over and brings them gifts every Christmas Eve. How can I be so sure he is real? Well, the letter below proves it, even if it was written 118 years ago. It has stood the test of time and is as profound today as it was in 1897. In fact, it might be wise for all of the sophisticated secularists who inhabit the editorial boards of the print and broadcast media to take heed to the words below. They were penned by one of your own, Francis Pharcellus Church, an editorial writer for the New York Sun during a time when there were no radios, airplanes, televisions, and even iPads. In fact, back then, besides talking to each other, people used pencils, pen and paper to communicate with each other. Can you imagine? Not believe in Santa Claus! You might as well not believe in fairies! You might get your Papa to hire men to watch in all the chimneys on Christmas Eve to catch Santa Claus, but even if you did not see Santa Claus coming down, what would that prove? Nobody sees Santa Claus, but that is no sign that there is no Santa Claus. The most real things in the world are those that neither children nor men can see. Did you ever see fairies dancing on the lawn? Of course not, but that’s no proof that they are not there. Nobody can conceive or imagine all the wonders there are unseen andunseeable in the world. Pope Francis has gone back to Rome. Sigh--I miss him. I live in central Florida so the closest he ever got to me was probably about 330 miles away and that was in a foreign country, Cuba. The closest I got to him in the United States was when he traveled to Washington, D.C. which is over 900 miles away. No matter, I do miss him. His gentle, kind and loving face was all over the TV screen since last Tuesday. I have been among his captive audience. It was so uplifting and refreshing watching this apostle of Christ and descendant of St. Peter do his thing and, on TV no less, for all the world to see.. Yes, I miss him. The Pope left last night at about 8 p.m. At 8 a.m this morning I was at morning Mass. The gospel reading for the day blew me away. This reading was not in place to reflect his visit but it did. The reading was scheduled for today and put in place on the universal church calendar several years ago. So, it is pure coincidence this gospel reading and his visit overlapped. If not, it was inspired from above. (That one works for me). An argument arose among the disciples about which of them was the greatest. 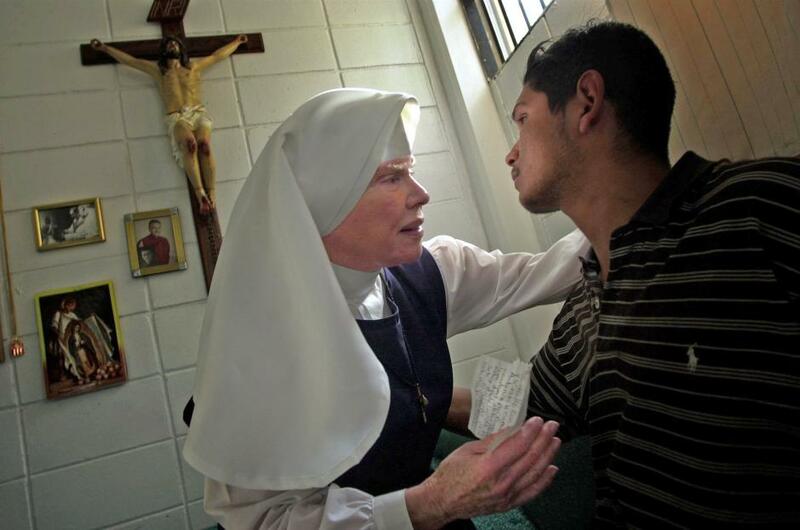 Jesus realized the intention of their hearts and took a child and placed it by his side and said to them, "Whoever receives this child in my name receives me, and whoever receives me receives the one who sent me. For the one who who is least among all of you is the one who is greatest." Jorge Mario Bergoglio never asked to be a bishop or a cardinal. He never "lobbied" for these positions or sought them out in any way. He did not have "super-pacs" at his beckoned call when the vacancy for Pope opened. He simply loved being a priest, working with the poor and homeless and doing his best to follow God's call so he would make his life pleasing to Him. Make no mistake, God called him to the papacy. The secular world would mock that concept but that is why they cannot experience the joy so many millions of faithful experienced in America over the past week. If they could only swallow their damn pride a bit and open their hearts they may find the elusive peace that evades them. 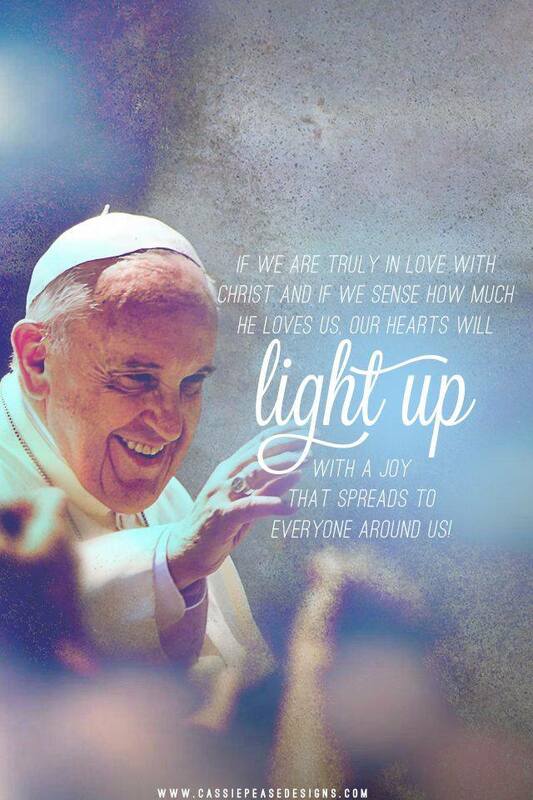 Pope Francis is filled with the Holy Spirit. That Spirit leads him to stop his motorcade and wade into a crowd of children and hug them and kiss their foreheads. It compels him to embrace the crippled, the disfigured, the mentally challenged, the homeless as well as the "uppity-ups". He has no qualms about walking into a prison and embracing hard-core murderers, rapists, thieves, and drug dealers. 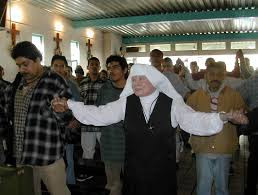 After seeing President Obama and offering Mass during his stop in Washington, D.C. he made a point of going to the offices of the Little Sisters of the Poor. He had to send a message to the entire world about the solidarity that exists within the Church when it comes to respect for life, ALL life. That message required no words---just action. The Pope gave that message by meeting with the Sisters who take care of the elderly poor, free of charge and have been doing so since St. Jeanne Jugan founded the order back in 1841 . Pope Francis has left our country. He has left it a more contented and inspired nation. He has reached out to everyone and many have responded. He represents the Goodness and Love that Jesus Christ brought to us. He is His ambassador on earth. He did his work well. If this had been a baseball game it would have been called "Perfect". But now it is over and the Prideful will resurface. Thanks for the grace, inspiration, love and memories Holy Father. We have to get you back here more often.